2. Fry the garlic and red chillies for a minute or two. 3. Add the broccolis and spring onions. 5. Add the prawns and cook for 2 minutes or until cooked. 6. Add the pasta and pour 1/4 cup of the reserved water. 7. Mix well and remove after a minute. 8. Season with pepper powder. 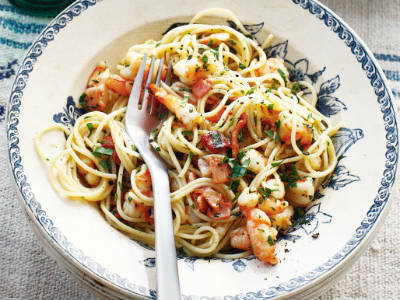 Feel free to comment or share your thoughts on this Prawn and Garlic Pasta Recipe from Awesome Cuisine.